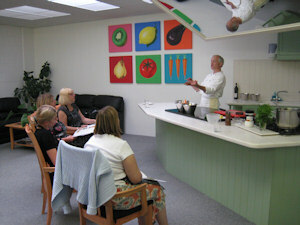 Private and Corporate group courses / team building events, held at our Amersham kitchen and demonstration area. We hold fun and informative courses / team building events and demonstrations at our Amersham base, or we can bring our team to your premises. Have you ever thought of entertaining some clients with a cookery day or motivating your staff with a team building day or evening? This is a fun and innovative way to build your team or get to know your clients better. Participants work individually (ideally maximum 8) or in pairs (maximum 12). Bespoke evening or day time courses can be arranged. We can also provide meeting and presentation facilities if you wanted to combine a cookery course or demonstration with a business presentation or talk. Our premises can also be hired out separately for meetings and training sessions. Would a cookery demonstration be an ideal focus for your business lunch or evening meeting? This could be an ideal choice of activity for a ladies lunch, rotary club or women's group event. We can provide the meeting facilities, the cookery demonstration and catering as required, all at our purpose built premises at Amersham. You can come to us or we can come to you. The choice is yours. Food for thought: Why not arrange to come and see our premises and have a chat about how we could work together to deliver a memorable networking event. Contact us now. Have you ever had a fantastic meal in a restaurant and wished that you could make it at home? Have you ever wished your husband or partner could cook? Or that you could improve your skills and make something a bit different for a change? Now is your chance to change all that by attending one of our cookery courses. From novice to professional we cater for all levels of experience. Be prepared to be entertained whilst learning the secrets of creating that perfect meal. Improving your cooking skills is a great way to meet new people and have some fun. All our courses combine a visual demonstration with hands on practical, cooking it yourself experience. The course finale is a 3 course meal with wine that you have prepared. 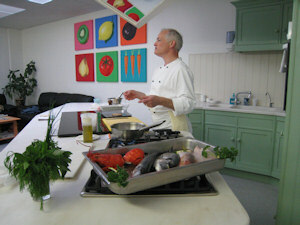 Our cookery courses are held at our purpose built kitchen and cookery school premises in Amersham. Food for thought - why not arrange to bring a group of friends together or give your partner a birthday treat? For our 2016 course programme view the course guide.